Curious to know what it's like to be in the line of fire? 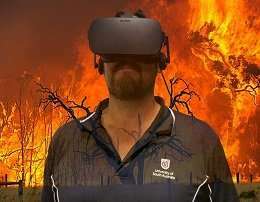 The new technology allows people to 'live through' a computer-generated scenario of a major bushfire in the Adelaide Hills, replicating fire conditions and strong, changeable winds fanning the flames, putting users under pressure to put their bushfire emergency plans into action. Safa's supervisor, Associate Professor Delene Weber, says the virtual reality experience allows people to experience some of the emotional pressures of a fire, and the reality that conditions can change quickly. "The scenario is realistic but safe and underlines the importance of being prepared in the event of a major fire," she says. The technology is timely, given the findings of a recent study which showed that SA residents living in fire prone areas need to shift their focus from a survival plan to creating and managing a 'fire-smart' landscape, as urban growth in Adelaide's fringes continues unchecked. The joint UniSA and University of Adelaide-led study explored the community's perceptions of vegetation management in peri-urban areas. Assoc Prof Weber, from UniSA's Natural and Built Environments Research Centre, says almost 1000 people living in fire prone areas were surveyed and hundreds more interviewed in focus groups. "Some key themes emerged," she says, "including the reality that it is becoming increasingly difficult to insulate people and assets from bushfire risk in South Australia.